One thing I always want to be on all my platforms (YouTube, Instagram, Twitter - come say Hi) is real. Yes I could do Instamakeup and pout and paint my entire house in Farrow & Ball Drainpipe, there's nothing wrong with that and I'd probably have a hell of a lot more followers. But that's just not me. My house is not Instagramable, it has old features, vom-proof carpet and half-painted rooms (til we fix the plumbing) and though I do sometimes like to trowel it on, my make-up is mostly quick, easy and as flattering as possible with a minimum amount of products. Since Ned started school my complete inability to remove myself from my bed before 8am (I will grab whichever kid is screaming and retreat back under the duvet) has made me really focus in on what's important to get done in the 50 minutes I have to get everyone up and dressed and out the door*. Do I feel comfortable facing the school mums with no make-up on? No, I'd rather go in my pyjama's and, although I don't go in my pyjama's I do just shove on what I feel like wearing, what's close to hand, and what will fair well lying on the floor desperately re-building the bloody Lego Scooby Doo Mystery Machine while Jim shouts 'build it BUILD IT' or taking Jack to Monkey Music. Mostly this involves Hush joggers and a band t-shirt and I'm ok with that. If you are prone to The Misery you have to know when to give yourself a break and I'm ok with being the least fashionable person at drop-off - as long as I have some make-up on. This was really bought to my attention the other day when, after a week in Birmingham doing a course I changed out of my uniform to tackle the Birmingham-London Friday evening drive. On went the Hush grey leopard print joggers and the grey Mere Soeur t-shirt and as I emerged not one but two people said in rather confused and amused tones 'ahh pyjamas'. And that sums it up really, I get up, change out of my actual pyjamas into what is essentially daytime pyjamas and then I'm ready for make-up. Yes women can have it all but for some of us that would mean a deterioration in mental health so for me I try to have what I need. And that's mascara at an absolute minimum. Don't get me wrong, I do go some places without make-up but for now the school gate is not one of them. So, I know a lot of people will say they just don't have time to do make-up in the morning, and neither do I. It takes me 5 minutes and yes it's my job etc but believe me I'm not doing anything technical here. I'm using easy products where they are needed and leaving the rest as it is. 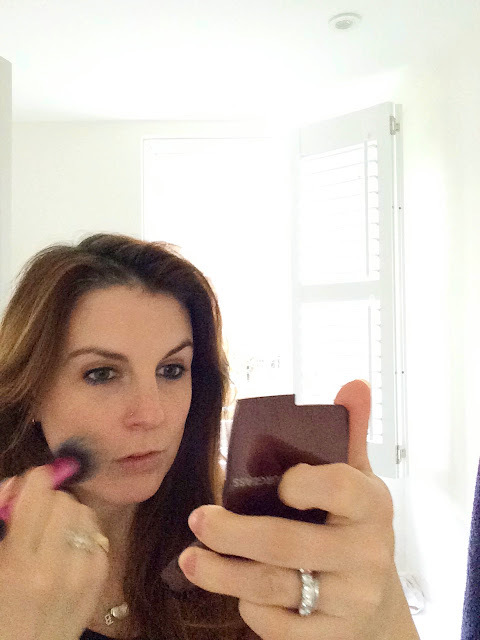 You can watch me do this in my Quick, Easy, Affordable School Run Make-up video. Of course you can do this make-up anytime but if I was going into an office I would always use a base because I have patchy skin, if I'm going to baby swim with Jim I use all waterproof products and as few of those as possible. So first things first, I cleanse and moisturise every morning without fail and every other day I will use an acid exfoliator/toner. Sometimes I use an oil or a serum but if I don't have time to leave it to do it's thing on my skin for a bit it's a waste of product in my book. Not only will a good skincare routine create a better base for make-up but it will mean that hopefully you can get away with less of it. Now for the make-up, here are my go-to products that I reach for in the mornings when I need to get three small people and one massive one, out the door. Please note I don't wear all of these together, these are the ones that are most in rotation. If you see something you like the look of then you can click through to my review of the product which I've put in brackets at the end. MAC Groundwork Paint Pot - an oldie but a goodie and one of those products that I think features in most make-up artists kit. This lasts and looks great all day, is an incredibly flattering colour to all eye shades, looks great as a base or on it's own. A wash of this and some mascara looks effortless. Louise Young Studio 54 Eye Shadow Trio - sometimes I want to make more of an effort and this will involve a small amount of blending. I'm always raving about Louise's products because she's a colour genius and with her eye trios she's basically done the thinking for you. I love each of these colours and it's so nice to smudge the dark green along the lashes as a change from black. MAC Smoulder - my ride or die black liner. 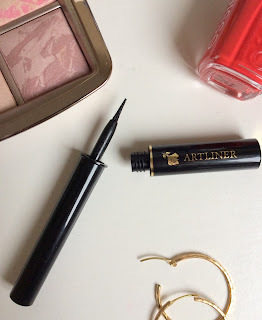 It's my go-to for the waterline as it has better staying power than the L&B kajal. I've yet to find another liner that competes with this one. Of course you don't have to wear black liner. If I were choosing a blue it would be this one from the Estee Lauder x Victoria Beckham collection, and I love the Estee Lauder Double Wear pencils for any colour, their green and brown are particularly nice. *I should mention that my husband is a total saint in the mornings and I basically don't have to do as much as that makes it sound.